Last weekend, I participated in our annual neighborhood progressive dinner. Today I’m sharing how ours is organized, what we served, and the recipes I used. 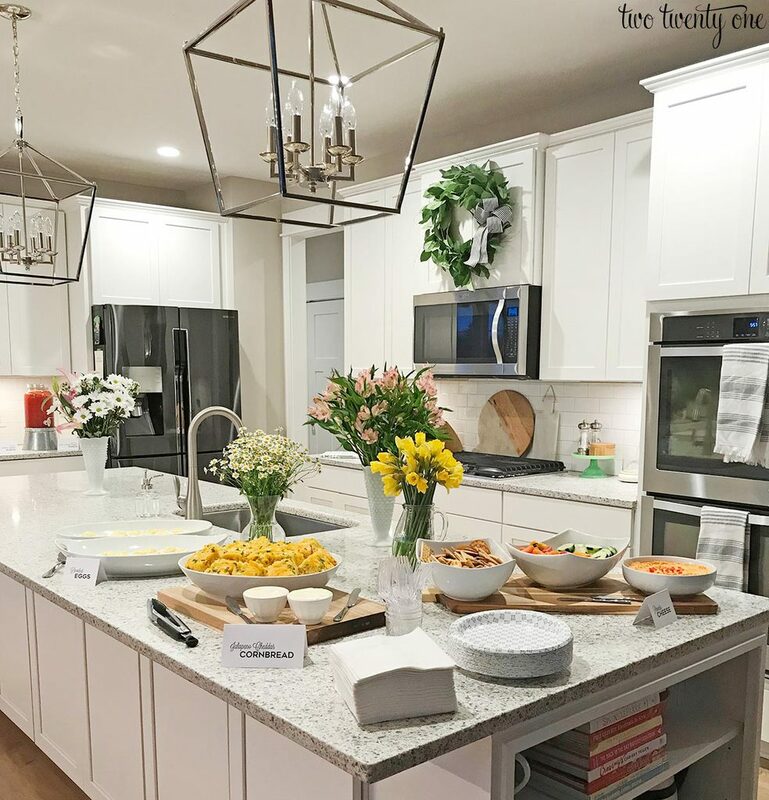 Our neighborhood has a social committee, so the social chair put a call out for progressive dinner hosts in our private neighborhood Facebook group. Those interested replied, and from there those who were serious met to discuss potential dates and themes. The way we did it last year and this year was that the host of the course also makes the food. But we’re thinking of changing this for next year because it’s expensive and a lot of work for one household to take on. Let’s say you want to participate, but you hate cooking, you could volunteer to host a course at your house, while another neighbor or two makes the food and brings it over. Or maybe you don’t want to host or cook, but want to contribute in some way. You could give money for or provide the plates and napkins. Last year, a poll was put up in our neighborhood group for everyone to vote on the best days that worked for them. This year, the progressive dinner hosts selected a day that worked for all the hosts. 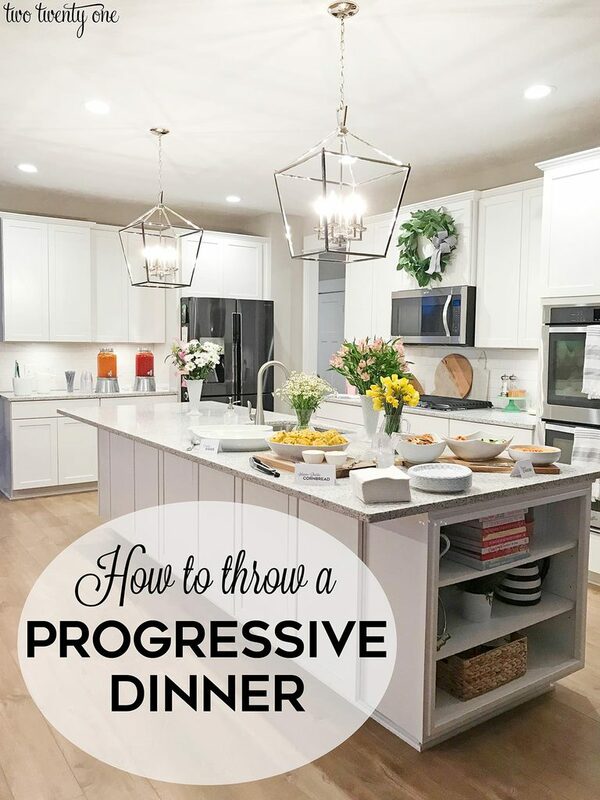 I’d suggest having a progressive dinner during warmer weather. Spring, summer, or fall would be great. There’s a greater chance for better weather in those seasons (i.e. no snow), people are less likely to wear big coats, and if you have an outdoor space, you can utilize that instead of having a bunch of people inside your house. When it comes to the food, it’s good to pick a theme. Last year, the progressive dinner theme was Italian. (My antipasto skewers would’ve been perfect.) This year, it was southern comfort food. Be creative! Around the World would be a fun theme. There’s also Mexican, American, Asian, Mediterranean, Indian, German, French, British, Irish, American comfort foods, etc. The neighborhood social chair created a post announcing the progressive dinner in our neighborhood Facebook group. This year, a progressive dinner Facebook event was also created so people could RSVP, giving us a head count. We also create and distribute paper invitations in everyone’s mailboxes because not everyone is on Facebook or in the Facebook group. We had around 36 people RSVP and attend the progressive dinner. In our neighborhood, the progressive dinner is an adult-only event. Last year and this year, one of our amazing neighbors has organized group babysitting at her house. She gets a headcount and hires 2-3 babysitters to watch the kids. She also orders pizza and gets drink for the kids. When the kids arrive, they each get a name tag on their back to help the babysitters identify them. A flat rate is paid per child for the pizza, drinks, and babysitter. Parents can add in extra money for the babysitter if they want. Last year, there were four stops– appetizer, salads, entree, and dessert. This year, there were three official stops– appetizer, entree, and dessert. We also have an after party at the babysitting house (we play games and drink adult beverages). When everyone arrives at the appetizer house, they write their name on a name tag and stick it onto their shirt. At the appetizer house, we do an ice breaker activity. Since our neighborhood is newer and smaller, the host printed out a blanket lot map of our neighborhood and provided pens. We went around meeting our neighbors and asking what lot they lived on. Then we’d write their names on that lot. This was a great activity and allowed us to find out where everyone lived and make small talk (i.e. “Oh, you live in the same model of house as us! How are you liking the layout?”). This year, the ice breaker was writing celebrity names on large labels, putting one on each person’s back, and then the person had to ask neighbors yes or no questions, attempting to figure out who their celebrity was. This year’s theme for our neighborhood progressive dinner was southern comfort food. I wanted to stick to finger foods to decrease on the amount of utensils needed. Although I did put out some plastic forks. 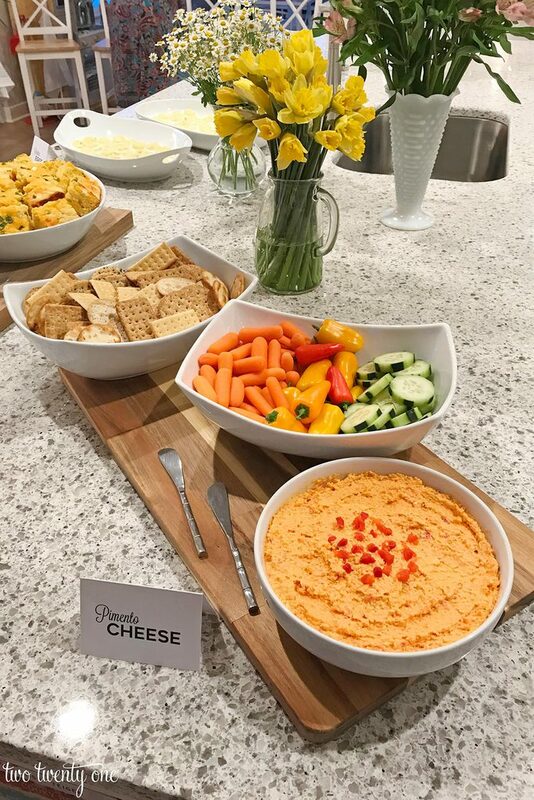 I made southern-style deviled eggs, pimento cheese with assorted crackers and raw vegetables, and jalapeño cheddar cornbread with butter. 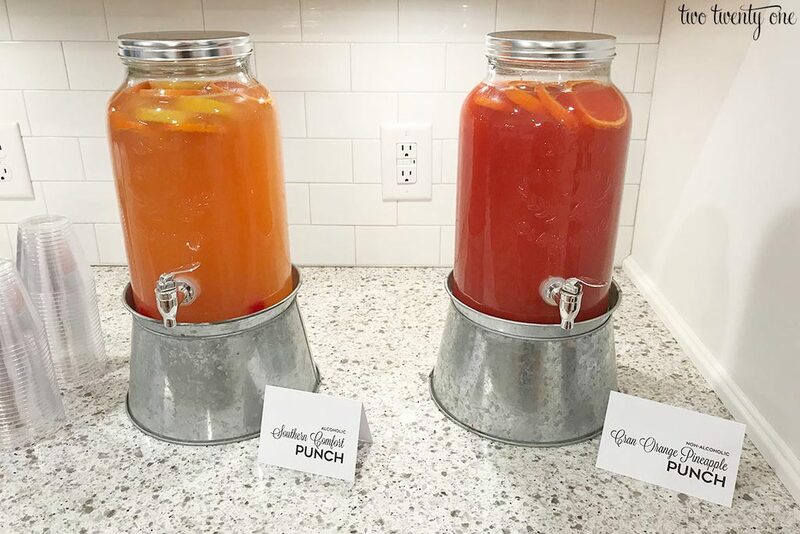 Each house also serves drinks, so I made an alcoholic Southern Comfort punch, a nonalcoholic cranberry orange pineapple punch, and I also put out a pitcher of water. The entree house served chicken, mac and cheese, mashed potatoes, and biscuits with butter and assorted jams. They also had 3-4 boxed wines and water. 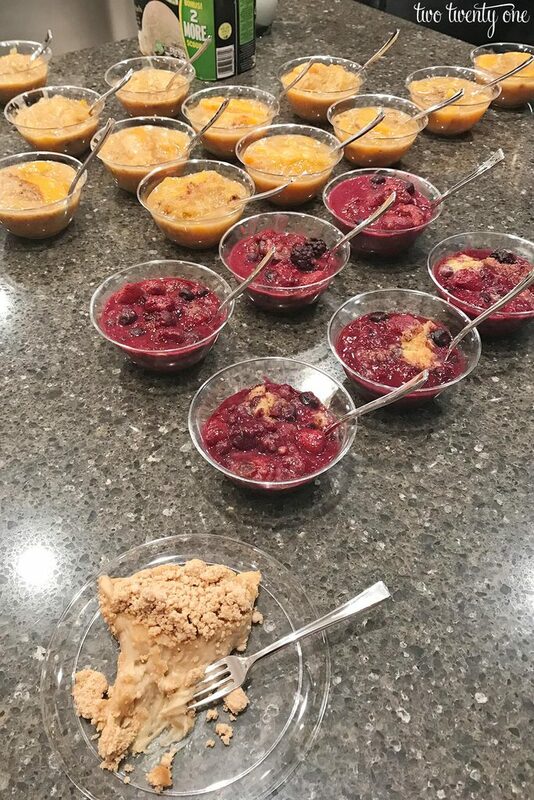 The dessert stop served peanut butter pie, mixed berry cobbler, and peach cobbler with ice cream. They served coffee. There was also a mini bar set up with some alcohols and mixers. If you’re looking for a cobbler recipe, I highly recommend my peach cobbler. I’m very pro-food tent cards. It’s so much easier for people to read what food is in front of them instead of guessing or asking the host. I quickly designed my food tents in Photoshop (you can use Word if you don’t have PS), printed them on card stock, and cut and folded them. hese are especially important when it comes to the drinks. If you’re serving an alcoholic punch, note that on the food tent. 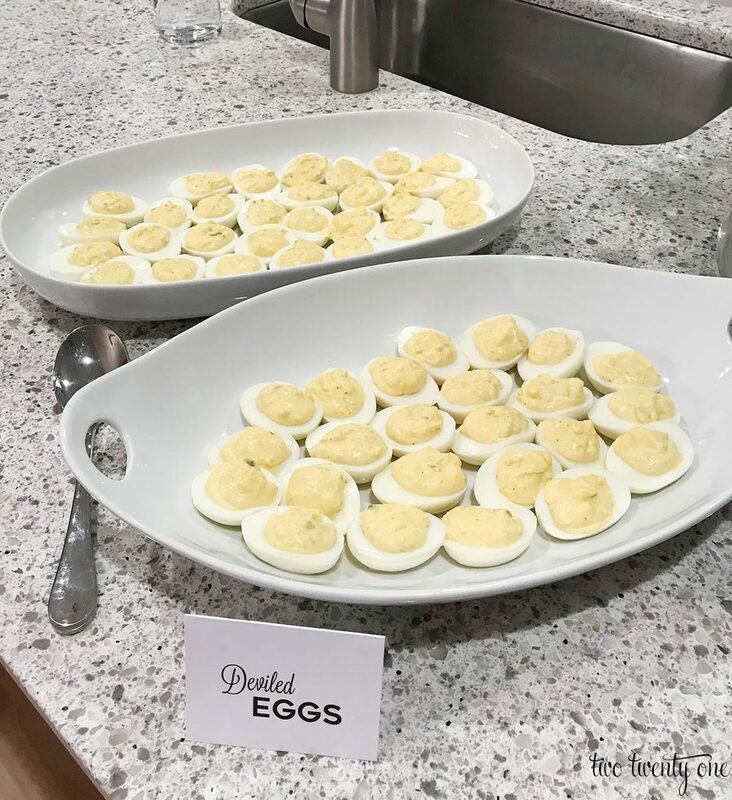 At the progressive dinner last year, the appetizer house had a punch. 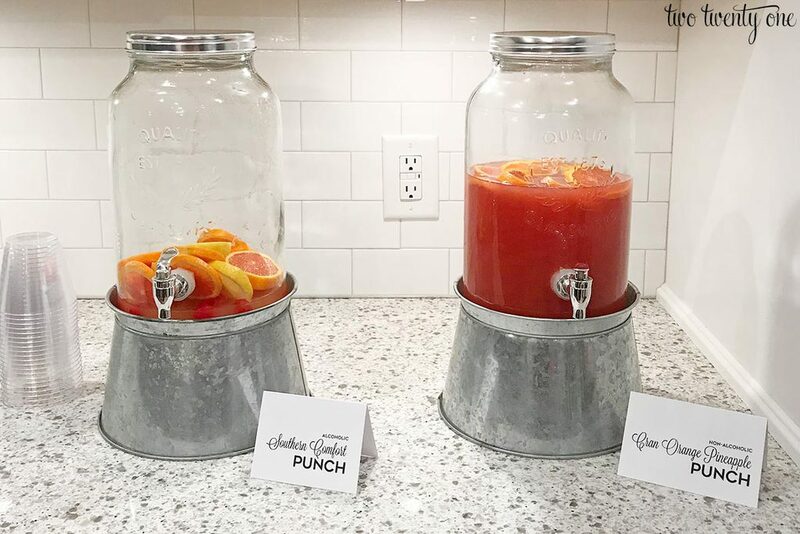 I didn’t think it was alcoholic because I couldn’t taste the alcohol and had taken a couple sips when, in front of everyone during the welcome and introduction, the host announced that the punch was spiked. I was 7 months pregnant so I casually, and not awkwardly at all, handed my punch over to Brad. When I posted about the neighborhood progressive dinner on Instagram, people asked me for recipes. So here are the recipes I used, along with the modifications I made. To save money on food, I shopped at Costco and Aldi. I used this recipe. I cut the red pepper flakes in half because I didn’t want to make it too spicy for people. In order to serve 36 people, I doubled the recipe. I also bought a 2 pound block of cheddar cheese and hand shredded the pound of cheese I used in the pimento cheese recipe. I patted the pimentos dry before adding them to the rest of the ingredients. Then, I pulsed all the ingredients together in my food processor. I used this recipe. Instead of 1/3 cup green onions, I used 1/2 cup. I used 3 large eggs instead of 3 extra large eggs. Instead of 2 cups of milk, I used one cup of whole milk and one cup of low fat buttermilk. I was afraid the cornbread would be too spicy with 3 tablespoons of jalapeños, but it turned out fine. 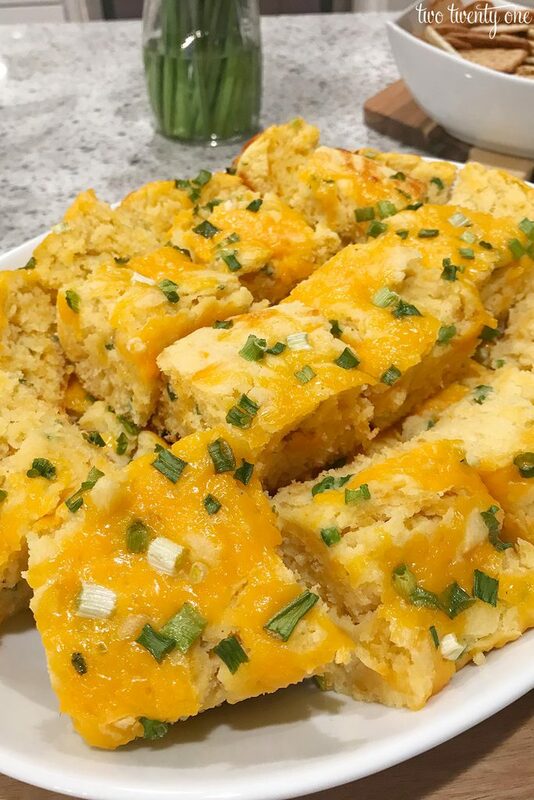 I hand shredded the other pound of cheddar cheese and used it to top the two pans of cornbread. I used this recipe. I patted the sweet relish dry to keep the filling from getting too runny. I tweaked it a little to taste because I had to multiply it by 4 since I used 30 eggs. Since I was cooking so many eggs, I used my Instant Pot. I put the eggs on the grate that came with the Instant Pot, filled the pot with 1 cup of water, cooked on manual for 5 minutes, let them sit in the Instant Pot for 5 minutes while the pressure released (I set a timer), and then I let them soak for 5 minutes in an ice water bath. I cooked 10 eggs at a time in the Instant Pot. Everyone LOVED this punch! I used this recipe. I modified it by adding ~10 maraschino cherries and about 1/3 cup of the juice. To keep the punch cooler, I threw my oranges and lemon in the freezer for a few hours. Right before the dinner started, I added the 7Up, and then I sliced the fruits and put them in the punch. I received a lot of compliments on this punch as well. There were just more boozers than non-boozers who attended the progressive dinner. Looks like lots of fun! What did you use to make the little signs with the name of each dish? I’ve always wanted to do that when I host a buffet. Thank you for bringing back grand memories for me. My Grandmother who lived in a cul-de-sac in Davenport Iowa threw parties just like this and I’m talking 1950s. There were 8 houses and all of them participated. Grandma had the biggest yard for summer dinners and a huge basement converted into a bar/dance room for winter and of course her house was the “after” party. That sounds like so much fun! I hope you have some photos of those parties because I’m sure everything was fabulous. My Mom’s family is getting together this spring. We rented some cabins all on the same street and we’re going to have a Progressive Dinner one night. Our house is salads and the theme Italian, so sadly I can’t use any of your recipes here for it. But I do want to try that Southern Comfort punch! The antipasto skewers are basically salad on a stick! Hah! 🙂 The SoCo punch was so good! It’s kinda dangerous though because you can’t taste the SoCo, but there’s a 750mL bottle in there. That sounds like so much fun! Would you like to adopt me?